This unknown court beauty is dressed in classical costume, placed in a capriccio landscape with a fountain in allusion perhaps to Diana. It was a popular pose that Lely used through the 1660s, and one which would have been chosen from a selection by the sitter. Our portrait, likely painted with the assistance of the artist’s studio, with its sense of scale and rich colour, its exquisite draperies, dramatic lighting, and romantic landscape, is typical of the artist. It is no surprise that for years Lely had no serious rivals, and was enormously influential. Lely places the sitter slightly off-centre in the canvas, a characteristic feature of his portraits. She gazes directly and intently at the viewer, and her features have been subtly individualised, although the highlights on her nose, and the rather limpid way the eyes are painted, are all typical features of Lely’s work. Private collection, Switzerland, until 2013. To be included in the forthcoming catalogue raisonée of the work of Sir Peter Lely by Diana Dethloff and Catharine MacLeod. 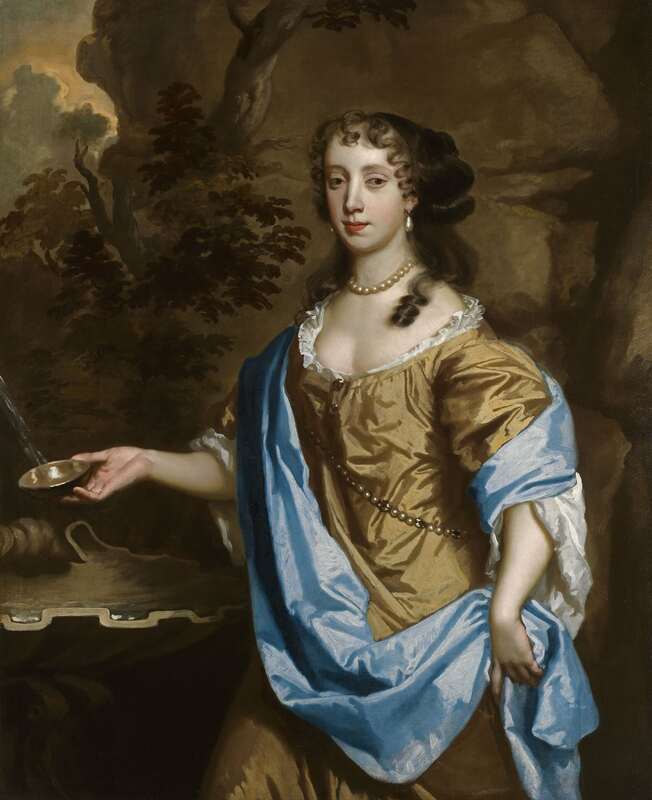 Peter Lely, the son of a Dutch military officer, was born in Germany at Soest in Westphalia in 1618. Though his family name was van der Faes, he assumed the name Lely after the lily that was carved on the gable of his father’s home in The Hague. He studied in Haarlem before moving to London in 1641 and in 1647 he became a freeman of the Painter-Stainers’ Company. Initially, Lely painted a variety of subject matter including landscape, religious, and mythological scenes, however, he quickly recognized the strength of the English market for portraiture. By working for many of the patrons of the late van Dyck, Lely rapidly established himself as one of the country’s most important portrait painters, including Charles I as patron. After his restoration to the throne by Parliament in 1660, Charles II proceeded to create and preside over one of the most cosmopolitan and extravagant courts in British history. As ‘Principal Painter’ to the King, Lely painted the most elite and influential members of the court.